Miller City’s Abi Reyna (2) attempts to defend Kalida’s Lauren Langhals (7) as she advances towards the goal on Wednesday evening. Kalida’s Peyton Wurth (6) of Kalida rushes down the sidelines as Miller City’s Abi Long attempts to chase her down on Wednesday evening at Kalida. 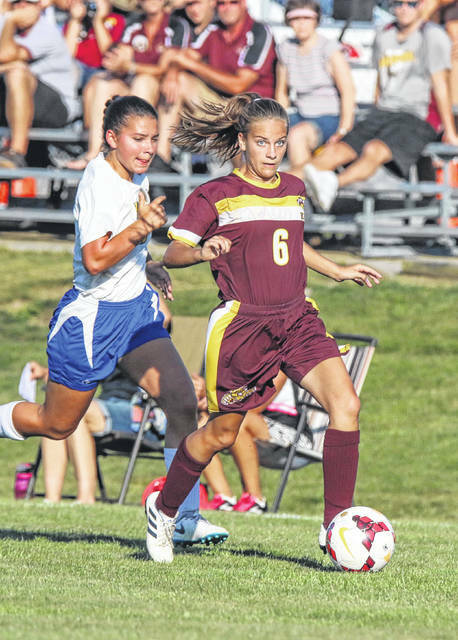 KALIDA – Miller City got off to a good start against Kalida in Putnam County League girls soccer that began Wednesday at Kalida Soccer Stadium. 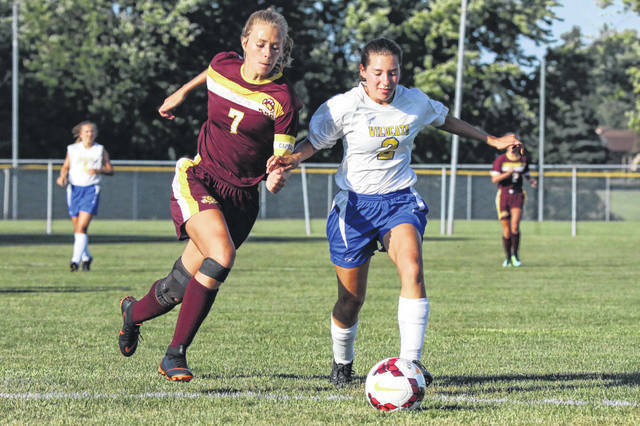 The host Lady Wildcats had more scoring opportunities in the matchup but the visiting Lady Wildcats took advantage of their best chance to escape with a 1-0 victory on a warm evening. Sophomore Miller City goalkeeper Natalie Koenig stopped 10 of 10 shots on-goal by Kalida in the match. Kalida head coach Dave Kehres admitted Miller City outplayed his unit. Miller City (3-3-0, 1-0-0) had their best two chances within the first 4 ½ minutes and made the second pay of against Kalida keeper Bailey White. Sophomore Kayleen Maas followed up her first offering from 8 yards with an even closer follow shot – after hitting the crossbar and collecting the ricochet – and put the ball into the net for a 1-0 lead at 35:43 of the first half. Miller City would only have one more shot on-goal the rest of the way – at 18:10 of the first half – as Abby Niese’s 16-yarder from the right wing was denied by White. Kalida also had nine corner kicks to 1 one for Miller City but could not convert. One of the best chances for Kalida came at 21:15 of the first half as Abby Wurth’s 12-yarder was defended by Koenig. Other good chances by Kalida came at 30:15 of the second half as Lauren Langhals had a header from in front that hit off the right post and the goalkeeper but they could not get a good follow shot. At 24:28, Langhals again got an opening as the goalkeeper came off her line but her shot from 16 yards was wide right. With just 44 seconds to go in the match, Langhals – who faced double teams almost the whole way – got an opening in front in hopes of tying the match but Koenig cut her off before she could get a shot off, preserving the clean sheet for Miller City. https://www.limaohio.com/wp-content/uploads/sites/54/2018/09/web1_Kalida-vs-Miller-City-Girls-Soccer-4216.jpgMiller City’s Abi Reyna (2) attempts to defend Kalida’s Lauren Langhals (7) as she advances towards the goal on Wednesday evening. https://www.limaohio.com/wp-content/uploads/sites/54/2018/09/web1_Kalida-vs-Miller-City-Girls-Soccer-4252.jpgKalida’s Peyton Wurth (6) of Kalida rushes down the sidelines as Miller City’s Abi Long attempts to chase her down on Wednesday evening at Kalida.